“Have you ever noticed that if you leave old junk lying around, kids will almost inevitably play with it? Nicholson, S, "How Not To Cheat Children: The Theory of Loose Parts", Landscape Architecture 1971. My children love using loose parts. We use very few actual "toys" in our play, as the majority of them have quite limited uses and once they've exhausted those uses, my children generally lose interest. Instead, I prefer to buy and collect open-ended materials that can have a variety of uses, only limited by my children's creativity. Children's desires to use loose parts are often demonstrated through the classic example of them being more interested in the cardboard box that a toy came in, than the toy itself. It allows us to see a child's need to be creative, to think "outside the box," to experiment and to control their play and learning while adapting it to their own interests. Little fingers also love little things. Bits and bobs and trinkets and treasures. Usually with younger children, people assume that anything they can fit in their mouth is too small, a choking hazard and should not be played with. However, I think that so long as there is adequate supervision, this is not always the case. 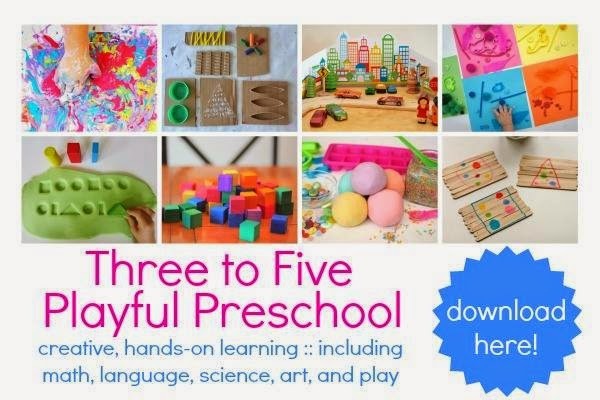 Aside from the development of physical skills, such as fine-motor, hand-eye coordination, etc., children can learn so much from these real life objects that they are able to manipulate and use in a large variety of ways. Of course loose parts don't need to be small items. They include any item that can be used in many different ways. From items in nature such as sticks, sand, rocks, shells, leaves, to junk items, sports equipment, recycled goods and so much more. The way that my children play and interact with loose parts outside and inside differs due to the different materials and space available. Below are some examples of the loose parts that we are currently using for our inside play. Most of these items can be purchased from $2 shops, found around the house or collected from nature. The items with an (S) next to them are part of our Spielgaben set. You can read my review and thoughts on Spielgaben and good quality educational toys here. There aren't any rules about what you can and can't use and it is good to keep adding new materials and mixing things up. The same materials can be used in so many different ways by combining them with various other materials to produce different results each time. I tend to store most of these items in cheap or recycled plastic container that are stackable. I also use things like recycled coffee jars and even vases to keep our loose parts out of the way but easily accessible. Below you can see just a few of the many ways that my children use these loose parts for play and learning. Many of the pictures come from our Instagram account where I often share our loose parts play as it's happening. Some of the pictures I have written posts about and have provided the links for you to check them out in more detail. Muffin tray, divided paint pallet, spoon, tongs, glass stones, shells and seedpods. Shape sort and count with 3D shapes, paper and pen. Pom-poms, glass beads, tongs and plastic glasses. Playdough, pipcleaners, craft sticks, animals and plastic cups. Invitation to play. Threading patterns with playdough, skewers, 3D shape beads. Glass beads, water, medicine syringe, tongs, plastic containers. Designs using pattern blocks, curved lines, straight lines etc. Enticing literacy. Making and writing words. Straight lines, curved lines, nature flash cards, paper, markers. An invitation to play and learn with numbers and natural materials. Construction building with blocks and tape. Matchsticks, plastic bears and playdough (in the other side of a divided water table). Coloured wooden pegs, bowl, spoon. 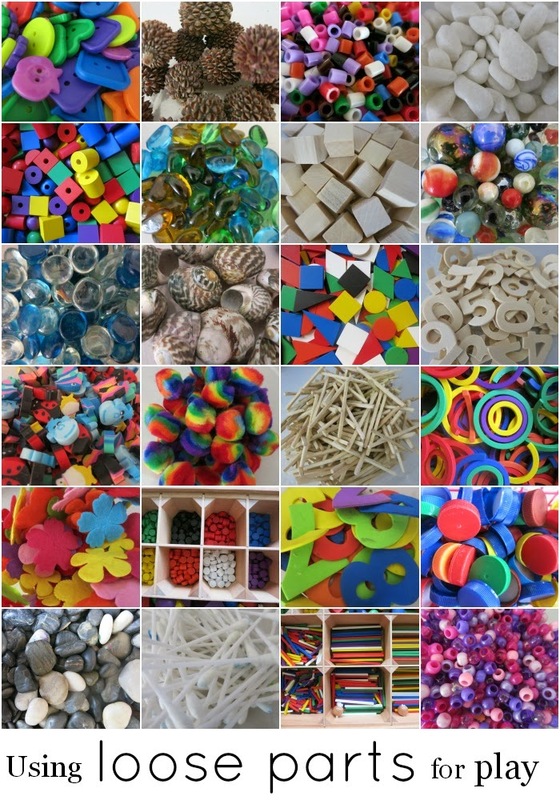 Which loose parts are favourites with your kids? What could be better than loose parts? :) So easy to set up and so much space for individual exploration and creativity. Love them :) I like the shape and colour sorting with the Spielgaben pieces. Sarah will like that too I reckon. 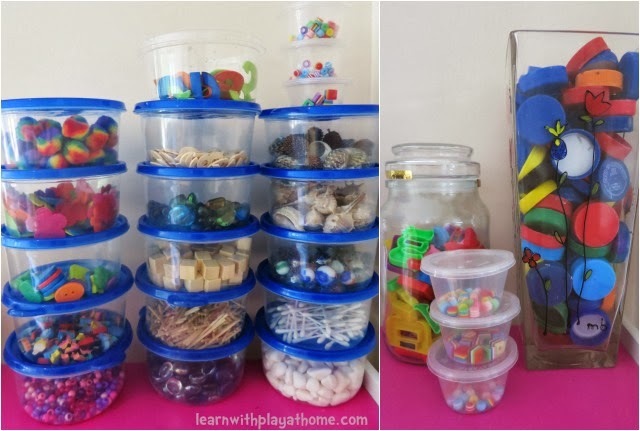 great post, I love loose parts, the mini erasers are a new one on me, might have to seek some of those out. Our current love is shells. We are just discovering the endless possibilities for creative play with loose parts and we LOVE it! The kids love making mosaics from glass gems, stones, bits of nature and scraps of fabric! My kids have always loved this type of play only it's rarely been organised by me and we've never had a proper name for it. Lot's of nice set ups here and I can imagine them keeping the lids busy for ages. That collage of all your loose parts is sublime! So enticing. 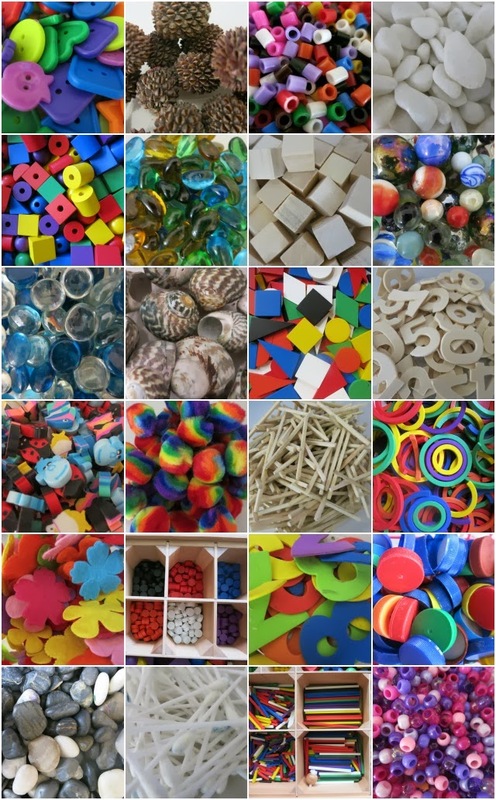 That fab image of all the different loose parts just makes me want to sit down and play with all that cool stuff! Love this! I saw your post shared on Google+. I miss the days of homeschooling toddlers and preschoolers. I love that anything left over is a loose part and can be used for play. Great post. So many activities with so many cool little pieces! There are so many great ideas here. How old are you children? Mine are 1 and 3, and my 1 year old still puts so many items in his mouth that I have to limit the loose parts my 3 year old can play with. How do you manage the mouth issue? Love this post and the many ideas that you share!